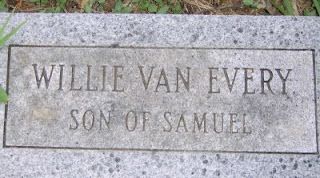 Below are the tombstones of 4 children of my second great grandfather, Samuel Van Every - all four of whom died as infants or young children. There is also one grandchild. 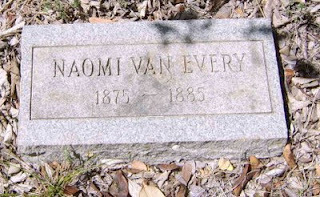 All five are buried at San Marcos City Cemetery in San Marcos, Texas. When an exact date is included, it comes from my notes. Unless otherwise indicated, the dates come from a cousin I had an email conversation with, and I currently have no documentation to back it up. All of the photographs were taken for me by an RAOGK volunteer. 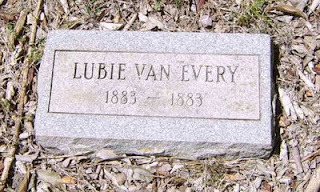 (*) Despite the tombstone, the 'Return of Death' record on FamilySearch says she lived from 1867-1872. This is also 5 years. 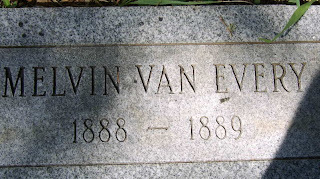 (**) Samuel's son Melvin Elijah Van Every (my great grandfather) lived from 1863-1929. This might be Melvin's son Melvin Theodore, who according to a Family Record sheet, lived from May 15, 1898 - May 11, 1899. Or it could be the son of another one of Samuel's children. 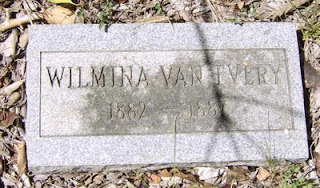 It's possible both Melvin and Wilmina's tombstones are replacements, and the original stones were illegible when the replacements were made. Amanuensis Monday: An unsent letter?